Stoning a blasphemer in ancient Israel. 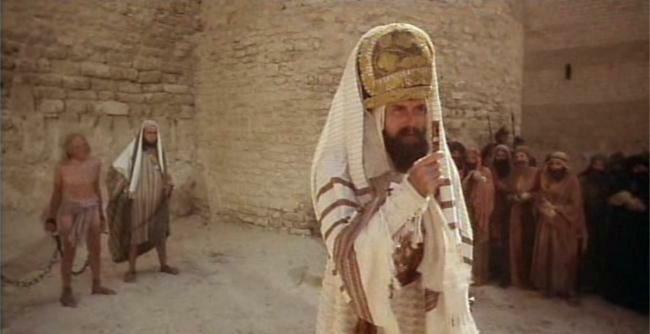 A scene from the film “Monty Python’s The Life of Brian.” The rabbi (John Cleese) is about to get bonked in the head. What’s so bad about stoning? All right, it’s a rhetorical question. I oppose capital punishment of any kind, and that includes stoning. Questions about what people “deserve” for various crimes are impossible to answer. How much punishment should they get? What kind? And who has the right or the duty to inflict the punishment? In an insightful book called Without Guilt and Justice, philosopher Walter Kaufmann (1921 – 1980) showed that those questions are much more difficult than you might think. The only defensible justifications for punishment are deterrence and rehabilitation. Under the United States’s current for-profit prison system, those goals are rarely achieved. But I digress. Much of the current publicity about stoning comes from the need to justify the U.S. government’s continued occupation of Afghanistan (which kills a lot more people than stoning). Neoconservatives also use it to demonize Iran in anticipation of an Israeli attack on that country (which would kill a lot more people than stoning). However, Sunday’s New York Times revealed some facts about stoning of which I was previously unaware. As horrendous as stoning is, some of the laws governing it seem to embody a certain amount of common sense. It’s not the unmitigated exercise in barbarism that some political writers make it out to be. Not unmitigated, at least. First, stoning is not prescribed by the Qur’an, the Muslims’ central holy book (they also recognize the Jewish and Christian scriptures). Instead, stoning is prescribed by Islamic legal traditions called hadiths, which are something like the interpretations of Jewish law contained in the Talmud. The hadiths apply it mainly to the crime of adultery. As is often the case, religious traditions develop laws based on the needs and customs of the society in which they arise. Because lineage and family were so important in Middle Eastern cultures, adultery was considered a very serious crime. The religious tradition prescribed a correspondingly serious penalty. Second, just as with Jewish and Christian religious law, very strict standards were established for proof of guilt. To prove adultery, four male eyewitnesses had to testify that they witnessed the act. That makes adultery difficult to prove because it is usually carried out in secret. As a result, stoning for adultery could be expected to be rare. Moreover, the four eyewitnesses had to give the same account of the facts. If their stories differed in any detail, they would be subject to punishment. That would discourage accusations of adultery unless the witnesses were quite sure about what had occurred and very serious about testifying. Yes, sometimes witnesses might collude. But getting four men to tell the same story, in the face of punishment if they’re found out, is a barrier to false accusations that would not exist if only one witness was required and if perjury was treated lightly. Third, the people responsible for convicting someone of adultery had to take personal responsibility for carrying out the punishment. If the adulterer confessed, then the judge had to cast the first stone. If witnesses proved the adulterer’s guilt, then one of the witnesses had to cast the first stone. For most people who are morally normal, the idea of injuring another person by stoning is horrendous. That, too, would discourage false or uncertain accusations. Of course, those are the Islamic laws and traditions governing stoning. Thugs and psychopaths don’t care about laws and traditions, so they’ll stone anyone they dislike and feel great about it. But that’s not unique to Islamic countries. The former head of Iran’s judiciary made several recommendations to judges not to impose or implement stoning sentences, but all have been ignored. Much like the United States, where it’s hard to rein in “conservative” judges who want to impose cruel and unusual punishments on anyone who falls into their clutches. Stoning is still wrong. It’s still barbaric, but so is all capital punishment. At least stoning seems to be governed by some sensible, if not failproof, safeguards. « What Caused the American Civil War? It also features a wonderful phrase for what we call “damned if you do, damned if you don’t”, which is “straited on every side”. I love that, and I’ve used it in writing a few times. Also at the same site are the other two parts removed from Daniel; The Prayer of Azariah, and Bel and the Dragon. And in my mother’s womb was fashioned to be flesh in the time of ten months, being compacted in blood, of the seed of man, and the pleasure that came with sleep. For there is no king that had any other beginning of birth. Thanks for another interesting and informative comment! I loved that phrase, “straited on every side.” I’d never heard that before, but will probably use it in my own writing, too. And it’s true that many interesting books and writings were removed from the canon of both the Jewish and Christian scriptures. I ought to be more familiar with those deleted works. The message I get from the verse you quote is the importance of humility, as well as the fact that we all face many of the same challenges in life. P.S. I incorporated your correction of the hyperlink.